Only comparatively recently have we in Britain come to appreciate and then value the herding or herd-protecting breeds of France . 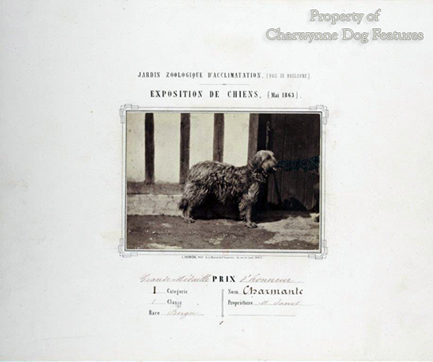 But nowadays,with 136 bouviers des Flandres and 274 Briards registered with the Kennel Club in 1986 to reinforce the Pyrenean mountain dog,our acknowledgement of their many agreeable qualities is manifesting itself . It is claimed I know that the bouvier des Flandres (or drover's dog of Flanders) is Belgian but the breed developed when Flanders,a medieval principality spanning what is now Holland,France and Belgium,was French,although there was once Spanish influence there too . I always think of the bouvier des Ardennes,a breed reminiscent of the pumi of Hungary,as the Belgian drover's dog,although again the Ardennes region occupies what is now Belgium,Luxemburg and northern France . Just as the bouvier des Ardennes looks like the pumi,all the French herding breeds resemble other European breeds too. The berger de Brie or briard is like the schafpudel of Germany,the berger de Beauce is similar to our own smooth collie,the berger de Picardie resembles our Smithfield sheepdog, the berger des Pyrenees looks like the Schapendoes of Holland,the Bergamese shepherd and our bearded collie, whilst the bouvier des Flandres has many similarities with our own drovers' dog,the old English sheepdog,also bob-tailed and able to feature a shaggy grey coat. Lesser known varieties like the berger des Pyrenees a face rasee or smooth-faced Pyrenean sheepdog, the berger du Langedoc or farou, the berger de Bresse,the berger de Savoie and the Labrit from Les Landes in the south-west indicate the way in which the various areas can produce their own types, rather as the Galway sheepdog, the Glenwherry collie, the Welsh hillman, the black and tan collie and the old Welsh grey existed in the British Isles. These regional differences, based on a very similar model, can be seen too in the herding breeds of Holland and Belgium, with the wire, short and long-haired varieties of the Hollandse herdershond, the four varieties of Belgian shepherd dog and the owtcharka breeds further east . Essentially we have a 20"-25" shepherd dog in a variety of coat-lengths and coat-colours fulfilling the same basic function. The mountain dogs illustrate the additional need for a much more substantial dog to repel wolves and human predators in the more isolated areas. But protection of their charges apart, the linking factor with all these breeds is sheep and to a lesser extent cattle, more particularly, man's trading in these grazing animals. Domestic sheep were first taken to Europe by early neo-lithic farmers around seven thousand BC These early farmers also kept cattle and had a need to prevent both animals from wandering and protect them from predators.Tame dogs would have been invaluable allies in the attempt to meet these needs. When these farmers moved on to new pastures their cattle, sheep and dogs moved with them. Up to 1000BC something like four-fifths of Europe north of the Alps and the Pyrenees was covered by dense forest and over the next two hundred years extensive clearance by farmers provided the basis for new growth through local trade, notably from the fairs dating from Charlemagne. This growth brought an unprecedented demand for good herding dogs, both to work the herds and get them to market. Bruges became the capital of medieval Flanders and was the chief European wool manufacturing town as well as its chief market; until its harbour silted up in the late 15th century it was the link between the Baltic, the North Sea and the Mediterranean. It would have been surprising therefore to find Flanders without really good sheep-driving dogs. In the south, Lyon played a key role in linking the inland market-towns with the ports further south. Again the need for dogs to drive the sheep and cattle was considerable. In the sixteenth century Spain had 3 million sheep and exported them both overland and to her new territories. The main trade was overland to France in the north over the Pyrenees, with dogs playing a vital role in this trade. Two hundred and fifty years ago the Danes were sending 80,000 head of cattle a year to Germany by driving them overland using dogs. The routes taken by the various drovers with their herding dogs crossed every European boundary and it would be unwise to claim purity of descent for the different national breeds of today. Similarities appear therefore in the herding breeds of Belgium, Holland, Flanders, Alsace, southern France and the Iberian peninsula, with the Catalan and Portuguese sheepdogs for example strongly resembling the berger des Pyrenees. These breeds indicating in this way the classic time-honoured drovers' routes of southern Europe. Few breeds of dog developed in isolation from their function. Against this background, the bouvier des Flandres became associated with the agricultural plain of Flanders and enjoyed a wide variety of names: vuilbaard(dirty beard), koe hund (cow dog) and toucheur de boeufs (cattle-mover or drover) . When cattle and sheep were transported to market and ports by rail and truck, concern was expressed for the dogs of the local drovers, rugged handsome dogs conforming to an identifiable type. In 1910 the bouvier was first exhibited as four varieties, the bouvier de Roulers for example being bigger and black, but in 1912 the growing band of enthusiasts combined forces to standardize these into one. Then the Great War played havoc with the breeding stock and it was left to a Belgian Army veterinary surgeon, Captain Darby, who by saving some good specimens founded the modern breed through his sire Ch.Nic de Sottegem. 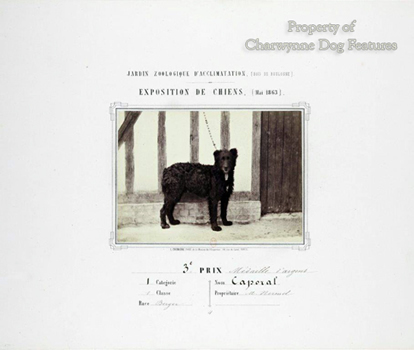 By 1922,the breed club had agreed the desired type and drafted a breed standard. Since then the bouvier has become more a personal guard-dog, police or army dog than a pastoral breed but has remained essentially a working dog. The first American standard was approved in 1959, and revised in 1975 following the sensible Franco-Belgian agreement. With the breed type now agreed internationally, the bouvier is gaining in strength in many widely-separated countries on sheer merit. I am more than a little puzzled though why the colour chocolate-brown should be so disliked and severely punished in the breed; if an otherwise good pup emerges in this colour, why consign it to the bucket? The berger de Brie has the same shoulder height of the bouvier but not the forequarter bulk. I get depressed when I read again the old fallacy of this breed originating in a barbet-beauceron cross, based on appearance presumably but denied entirely by history. 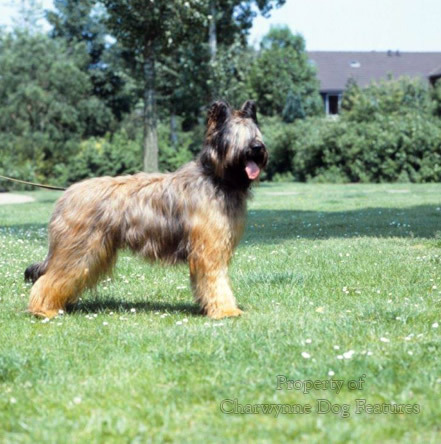 The Briard has existed in its own right for as long as the Beauceron and belongs to a type which breeds true all over Europe. Of far greater interest is the observation that this breed-type appears wherever the Celts settled. The most numerous of the French sheepdog breeds the Briard has, like many of the multi-talented herding breeds, been used widely, as a police-dog, red-cross dog, sentry-dog and ammunition-carrier. Dogs like the Briard are alleged to have been utilised by Napoleon to drive livestock during his Egyptian campaign; the Egyptian sheepdog of more modern times, the Armant, being coincidentally very like a Briard . The Marquis de Lafayette brought dogs of this type to north America to work with sheep. 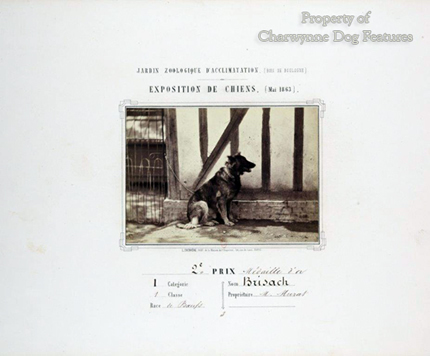 The Club Francais du Chien Berger de Brie was not formed however until 1897,despite one of the breed being placed first in the class for sheepdogs at the first French dog show held in Paris over thirty years earlier. In the modern breed I have concern still about their temperament especially excessive shyness, having learned long ago the deceptive and unpredictable nature of this feature. But there seems to be a responsible breed club in Britain working to improve every aspect of the breed here. The French herding breed which impresses me the most in that country however is the Beauceron, a strapping handsome dog with the majesty of the Akita and the alertness of the Dobermann. (I strongly suspect that Herr Dobermann resorted to Beauceron blood in the creation of his breed). Black and tan or harlequin and sometimes dubbed 'bas rouge' or red stockings because of its red-tan legs, the Beauceron is little known outside France but is attracting interest in the United States where a breed club has been formed and a stud-book opened. A big, robust, powerful, muscular but not heavy breed, 26" at the withers, very strong-minded and rather fierce in appearance, it is one of the few breeds whose strength of will you can sense and whilst it lacks the "strong eye" of our working sheepdogs, its work with cattle is in the brusque no-nonsense style. They have been used by both the French army and the police and my French friends tell me they were originally hunting dogs used on boar and stag, representing an ancient French type. The harlequin factor is found in hounds, as the Dunker hound, the Great Dane and the dachshund illustrate; the "merling" of the Beauceron is more like the hound-colouration than that found in collies. The Farou or berger du Languedoc, also called the berger de Camargue and chien de Larzac is probably a southern version of the Beauceron. The Labrit, probably getting its name from the town of that name in the south of France, (although some suggest it comes from de la Brie, since it is Briard-like and there was a tendency in the last century to call all French smooth-haired shepherd dogs chiens de Beauce and all coarse-haired dogs chiens de Brie) is probably more closely related to the Pyrenean sheepdogs. The berger de Bresse is almost certainly now lost to us and the berger de Savoie,Beauceron-like but drop-eared, may too not have survived. We have probably lost more types of herding-dog all over Europe than of any other group; the pastoral scene has changed dramatically in this century and the advent of the pedigree dog has seen human whim play its part too. But this group of dogs have given man supremely loyal and devoted service over many centuries and whether French in origin or British deserve our gratitude.